Even mentioning the word "prenup" can bring up bad feelings between some couples, but it is important to know what you're agreeing to before you sign. Here are six prenuptial mistakes you should avoid. Do you know what prenuptial mistakes you should avoid before signing an agreement? If you don’t, you should reconsider signing until you do. Even mentioning the word “prenup” can bring up bad feelings between some couples, but it is crucial to know what you’re getting into if it is something you and your partner have decided to do. What is it about premarital agreements that upsets people so much? But then again, why do we believe it’s a sign of true love to go into marriage unprepared? Here are 6 Prenuptial Mistakes to Avoid. Prenups are contracts drawn up before marriage to establish what happens to the finances if a couple divorces, one spouse becomes incapacitated through illness or injury, or one spouse passes away. These agreements can assert your rights to the property you bring into the marriage, talk about your rights to buy or spend assets, decide what happens to inheritances either of you receive, determine who will control the family businesses, and more. There are many things that are frowned upon while drafting a prenup, so the best way to figure them out is to talk to a professional. 1. Not taking the time to cool off and reread it. You want to show your love for your significant other, so you barely glance at the document. That doesn’t mean they have thought of everything, or that the language they used makes sense. Unclear or ambiguous phrases can lead to contentious divorces down the line. Also, a person can be unfair or biased toward their own best interests without realizing it. Slow down, and don’t sign your prenup in a hurry. 2. Putting in the wrong things. There are outrageous provisions that a family court judge just won’t allow. For example, a judge would not permit a prenup provision that demands a certain amount of sexual contact, or giving all of the household obligations (like cooking or cleaning) to just one spouse. In addition, you shouldn’t make overly optimistic promises you may not be able to fulfill. The courts may look at that as fraud, used to trick your partner into signing the agreement. 3. Not hiring your own prenuptial lawyer. Hiring an attorney can be expensive, and perhaps you and your significant other might believe you can save money if you see a legal professional together. But just as you wouldn’t speak openly to a therapist with someone else watching, it’s important to have an advocate for you – and you alone. Get a legal professional on your side who will search for the best solutions and help guide your decisions. 4. Not mentioning something important. A lack of “full and fair disclosure” will invalidate a prenup. For example, if you’re on the fence about the whole agreement, and you decide not to let your partner know you have a vacation condo in Mexico, your condo won’t be protected if you divorce. If your partner can prove that you lied or omitted some financial assets from the prenup, it will be set aside. The same thing is true of debt. People rarely like to admit to having financial problems, but failing to do so is considered fraudulent. Disclose everything, good and bad. If you don’t, it will just leave you without protection. 5. Going along with it when your gut says no. You can’t be pressured, coerced, or guilted into signing a premarital contract. If you wouldn’t sign the agreement happily, then don’t sign it at all. Have your prenup attorney negotiate until you get it right. By the same token, don’t try to force your soon-to-be spouse to sign if they don’t want to. If one of the spouses did not sign voluntarily, family court will not enforce the contract. 6. Forgetting to make it legal. You and your significant other have done it – you’ve argued, negotiated, and finally agreed on what should happen if something goes wrong with your marriage. You both sign the online do-it-yourself forms you printed out, and file it away in a drawer. Unfortunately, this agreement isn’t legally binding. Was it reviewed by an attorney and approved by the court? Whether you are wealthy or not, a prenup can protect your rights, assets, and future. They aren’t signs of greed. Prenuptials bring financial forethought and responsibility to the table before the marriage even begins, which is a benefit for the couple. Remember: if you and your spouse want to, you can make amendments to the prenup later on—you’re not trapped in this contract forever. For more help understanding what prenuptial mistakes you should avoid, it is in your best interest to contact a family lawyer. How can a prenuptial agreement protect assets for children? 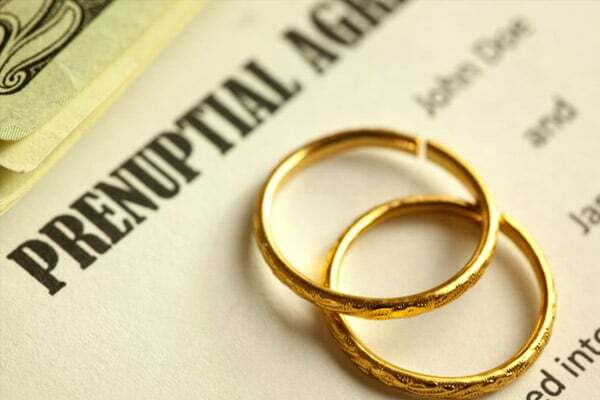 What should be included in a prenuptial agreement for a business owner?